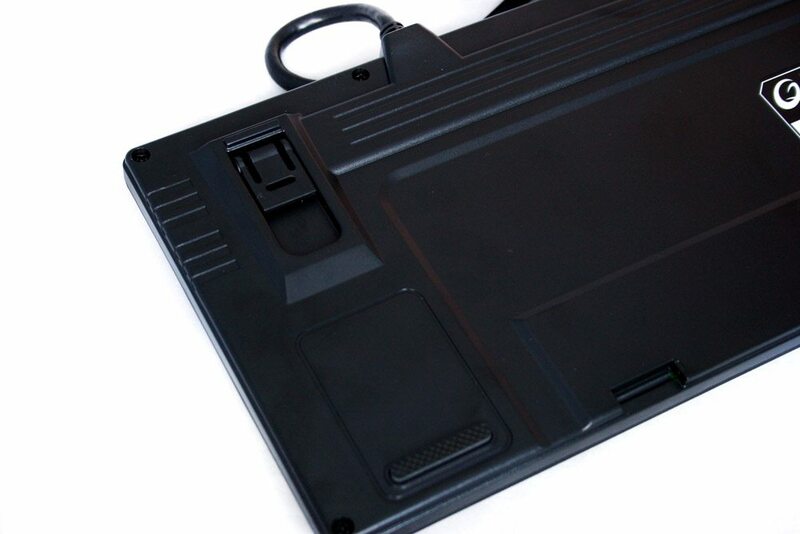 The board itself is a nice matt black colour with a soft rubber coating across the entire surface. This differentiates the MK 80 from its competitiors who usually opt for hard plastic. 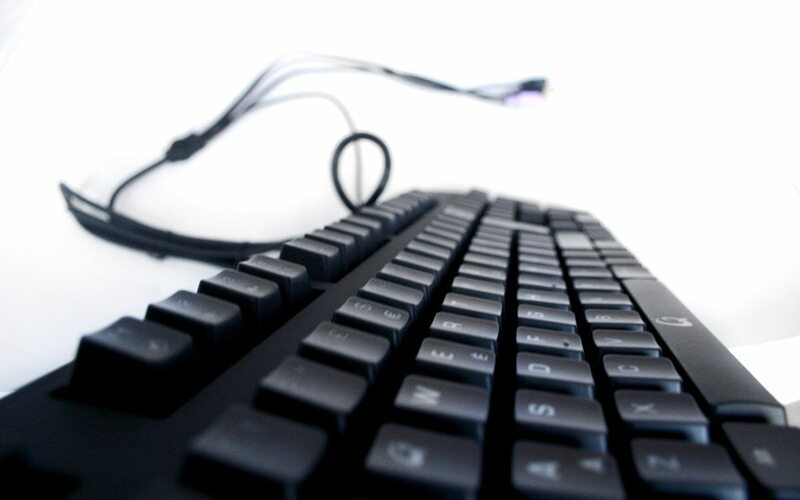 It has the traditional mechanical board feel by being quite heavy and very robust. 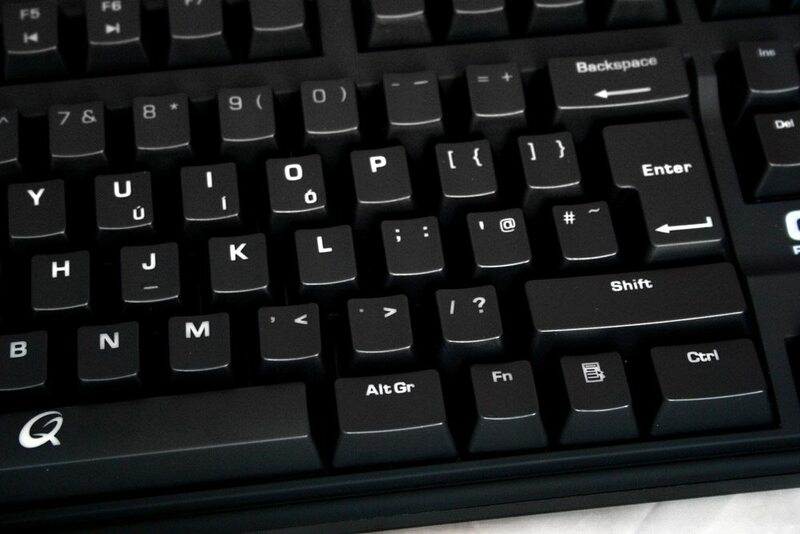 The keys are designated with translucent white plastic. This allows the backlights to shine through; it should also mean that they won’t rub off with extensive use. 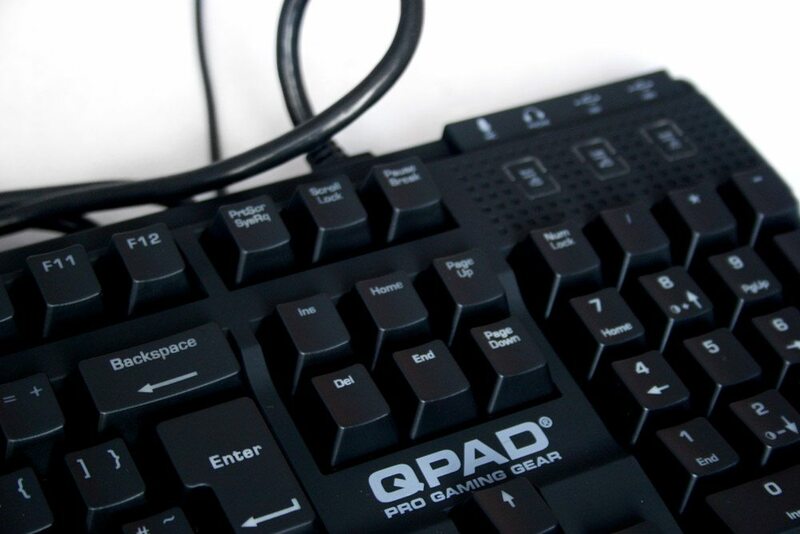 There’s a few QPAD logos across the board, with the most obvious one sitting underneath the End key. In the upper right corner are the lock indicators. These ones light up blue when on and have little padlocks on each one (how cute), as well as the full phrasing of “Num lock” etc. 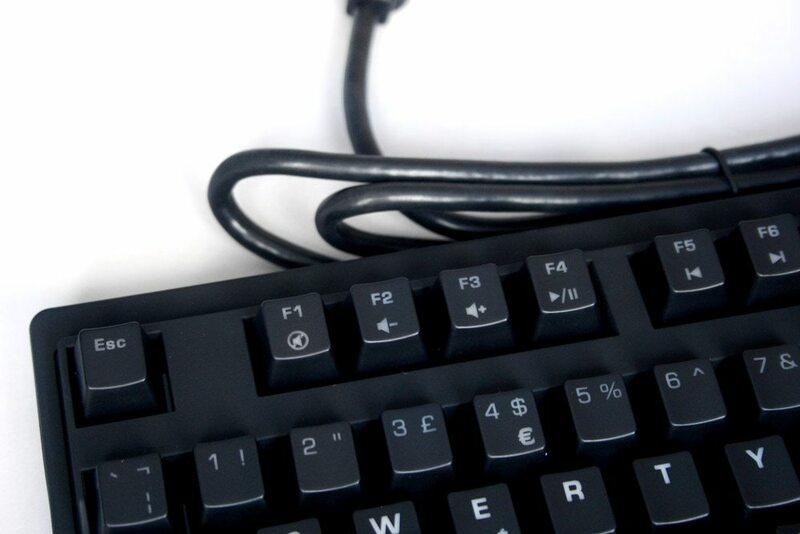 … as secondary commands for the F1-F6 keys. They provide basic functions like Mute, volume up/down, play/pause and skip back/forward. The underside is what you’d expect with small rubber feet in the corners and plastic wedges to change the angle of the board. Removing a couple of the keys we get a look at the Cherry MX Blue switches. 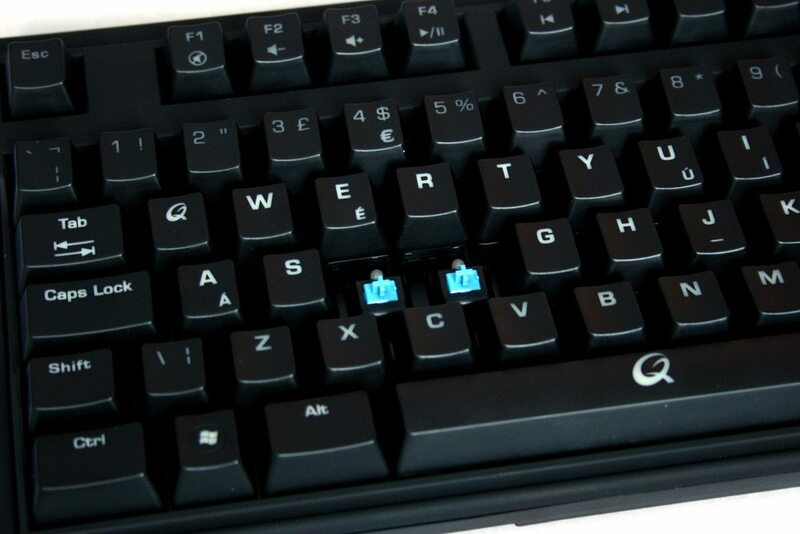 This was an interesting choice for QPAD as Blue switches tend to be used less frequently by gamers due to their tactile nature and clicky feedback. When powered up and with the red gaming keys added to the WASD sector of the board, the QPAD does look quite good. You certainly won’t have any trouble using it in the dark. 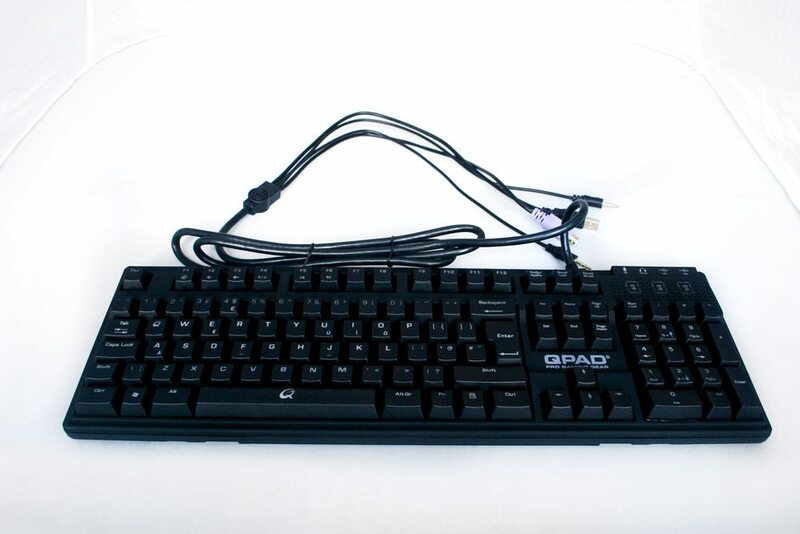 It may be of interest that QPad were / are offering the kb with any Cherry key of choice, direct from their factory in Europe. I bought the MK80 with brown keys about nine months ago. There was a delay due to material shortages, for which thay were very apologetic, and even sent me a free mat to compensate! Lovely people to deal with. Oh; yeah. Got to say: I love it!